Gothic Funk Press, 9780989920230, 450pp. 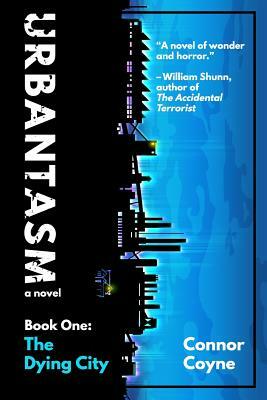 Urbantasm is a magical teen noir serial novel inspired by the author's experiences growing up in and around Flint, Michigan. Thirteen-year-old John Bridge's plans include hooking up with an eighth-grade girl and becoming one of the most popular kids at Radcliffe Junior High, but when he steals a pair of strange blue sunglasses from a homeless person, it drops him into the middle of a gang war overwhelming the once-great Rust Belt town of Akawe. John doesn't understand why the sunglasses are such a big deal, but everything, it seems, is on the table. Perhaps he accidentally offended the Chalks, a white supremacist gang trying to expand across the city. Maybe the feud involves his friend Selby, whose father died under mysterious circumstances. It could even have something to do with O-Sugar, a homegrown drug with the seeming ability to distort space. On the night before school began, a group of teenagers took O-Sugar and leapt to their deaths from an abandoned hospital. Connor Coyne is a writer living and working in Flint, Michigan. His first novel, Hungry Rats has been hailed by Heartland prize-winner Jeffery Renard Allen as "an emotional and aesthetic tour de force." His second novel, Shattering Glass, has been praised by Gordon Young, author of Teardown: Memoir of a Vanishing City as "a hypnotic tale that is at once universal and otherworldly." His essay "Bathtime" was included in the Picador anthology Voices from the Rust Belt, and he has authored a short story collection: Atlas. Connor's work has been published in Vox.com, Belt Magazine, Santa Clara Review, Moria Poetry Zine, East Village Magazine, Flint Broadside, Moomers Journal of Moomers Studies, The Saturnine Detractor, and Qua. Connor is on the planning committee for the Flint Literary Festival and in 2013 represented Flint's 7th Ward as its artist-in-residence for the National Endowment for the Arts' Our Town grant, documented at Intersect 7. Connor lives in Flint's College Cultural Neighborhood (aka the East Village), less than a mile from the house where he grew up.